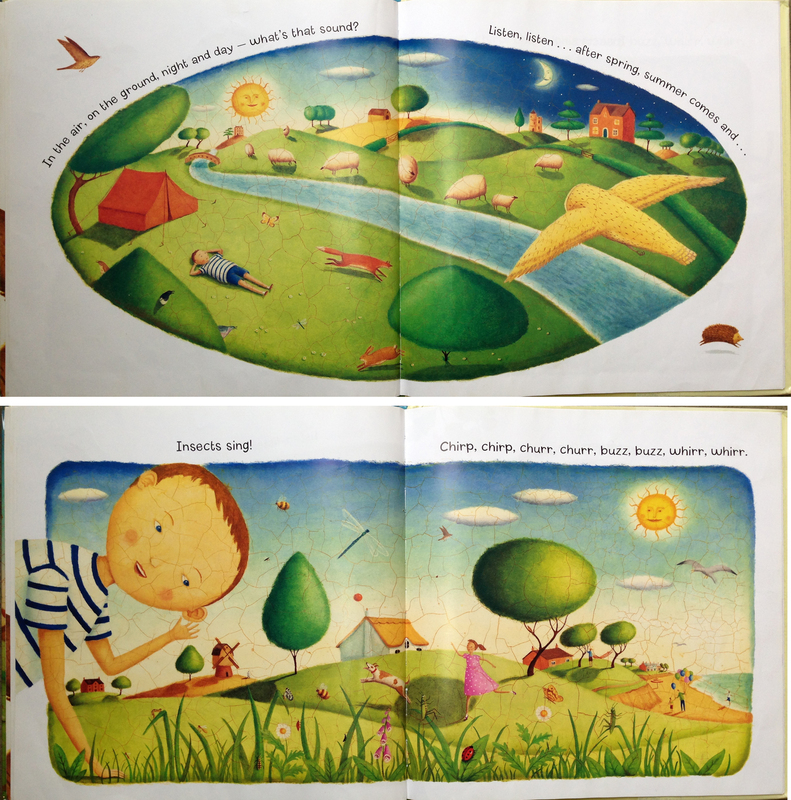 Listen, listen is a quality piece of children’s literature that takes the reader on a journey through the cycle of seasons, relating to the reader through the senses and connecting to their experiences of life’s cycles (Gershator, 2007). It also provides a rich example of various language features (see Textual features handout). Language features involve the arrangement of language in particular ways to cause particular effect. An author can manipulate the elements of language to create aesthetic value, enhance a reader’s engagement with the text and create meaning (Australian Curriculum, Assessment and Reporting Authority, 2013). The introductory pages of Listen, listen provided below reveal a plethora of such examples. Listen, listen . . . What’s that sound? Insects singing all around! Leaves rustle, hammocks sway. Splish, splash, children play. Clouds drift, dogs run. Sizzle, sizzle, summer sun. The text begins by commanding the reader to listen and asking them what they hear. This initial invitation engages the reader as an active participant of the text; they are hooked into the action. This is maintained throughout the pages as the verbs are written in present tense and the reader is therefore able to experience such actions in real time: “Leaves rustle, hammocks sway… clouds drift, dogs run”. This enhances the readers’ engagement with the text as does the visualisation of those actions that such imagery creates. The consonance technique of sibilants is utilised throughout the text to enhance the sensory experience, for example, enhancing the splish splash of water and the sun’s sizzle. When read aloud, the repetition of the ‘s’ sound used when inviting the reader to listen to the insects actually creates the illusion of insects buzzing. The onomatopoeia which follows elaborates on the already established insect sounds. Onomatopoeia is used as a technique throughout the text which accentuates its namesake and invitation to the reader: Listen, listen. Listen, listen is structured as a poem with each season dedicated one stanza with the words listen, listen used to signify each season’s beginning. There is a rhythm to the text and the author has utilised an AABB rhyme scheme throughout which provides a flow and sense of movement to the words. There is predictability in its repetition of sounds, structure, words and phrases which make it inviting through the familiarity it creates, especially for younger readers (Winch, Johnston, March, Ljungdahl & Holliday, 2010). At the end of the text the structure is broken and the author reiterates the introductory words, highlighting the cyclical nature of the text and of the themes within (see below). The simplicity and small amount of text ensure that the multitude of language features within do not overpower or detract from their effectiveness. In essence, Listen, listen provides a wonderful example of the effectiveness of a selection of language features. Gershator, P. (2007). Listen, listen (A. Jay, Illustrator). Bath, UK: Barefoot Books. Winch, G., Johnston, R., March, P., Ljungdahl, L., & Holliday, M. (2010). Literacy: Reading, writing and children’s literature (4th ed.). South Melbourne, VIC: Oxford University Press. Posted in Children's literature, Uncategorized and tagged Children's literature, Language features, Onomatopoeia. Bookmark the permalink. Thank you submitting this blog, it looks wonderful! As you know, this entry may or may not be assessed so we are therefore not providing specific feedback at this stage.